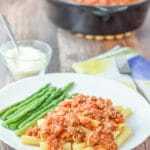 This is my ragu Bolognese recipe! It is chock full of beef and pork and so delicious. I love to top this on some pasta as well as my ricotta gnocchi. My mother didn’t make this ragu. In fact, if we had gravy, it was always her version made with various cuts of meat. Everyone in my family makes their gravy differently, including me. My mother made hers in a pressure cooker. Some of the ingredients she used were, let’s say, animal parts that you probably would never eat unless you were either enticed with the offer of a million dollars or you didn’t know what they were. For instance, my mother frequently put pigs feet, tails and ears in her gravy. I liked the pigs feet. The tails and ears I could do without, but I would still eat gravy that contained them if it were offered by a relative. My mom’s gravy also had pork, beef, sausages and meatballs. As you can see, it was chock full of meat. You are all going to think I’m nutso, but cotica is pig rind (skin) cut in a roughly 6″ by 9″ long sheets. 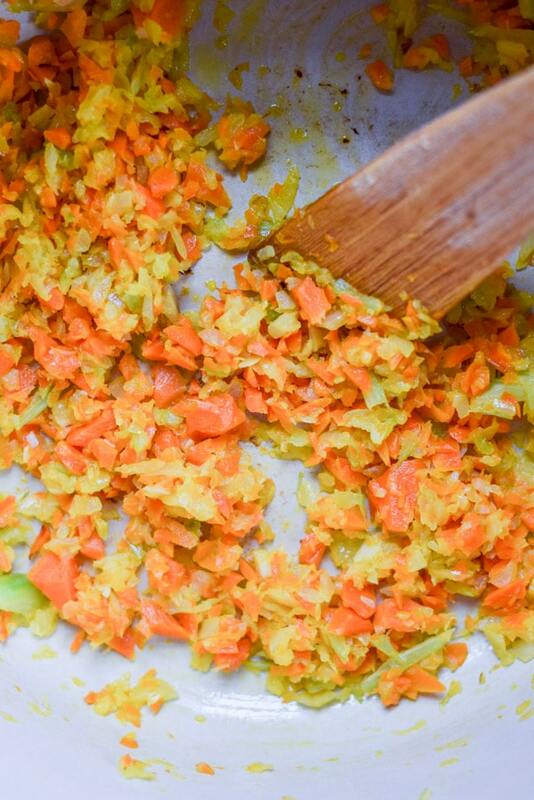 You lay it on your cutting board, sprinkle salt, pepper, herbs and garlic powder on it. Next you roll it up to form a little tube and secure it with some twine. Then you stick it in the gravy you are cooking and when it’s done, you slice it and eat it all up. My family lines up for this delicacy. It probably doesn’t sound it to you, but it is totally yum. I wish I could make some now. Not sure where I’d get the pig rind (skin), though I would first try the local butcher. Do you eat anything other people would think was odd if they knew you ate it? Do tell in the comment section. I promise not to judge since I’m cray-cray for weird foods. 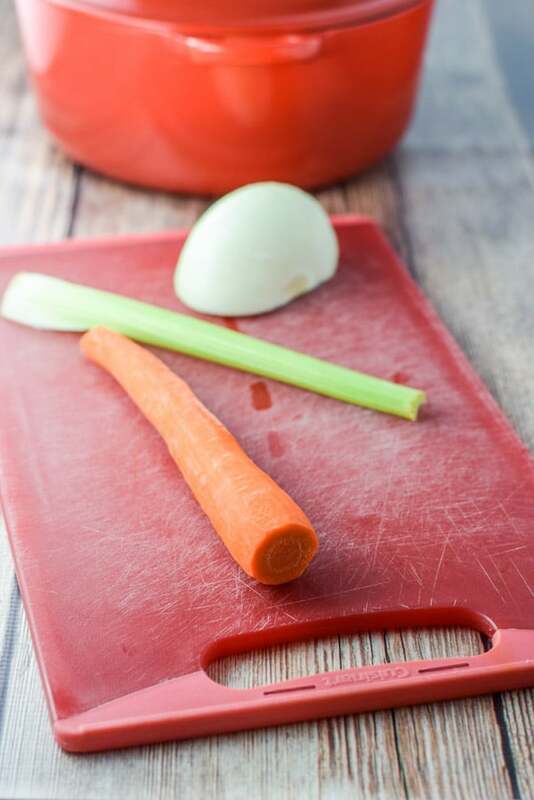 Time to get the first few ingredients: a carrot, celery stick and half a large onion. Out comes my food processor and in go the veggies. I pulse them until they look like they are diced. I heat up my heavy stockpot on medium and put 3 tablespoons of olive oil in it. When that’s heated, I add the veggies along with some salt and pepper. I sauté them for 8 minutes. 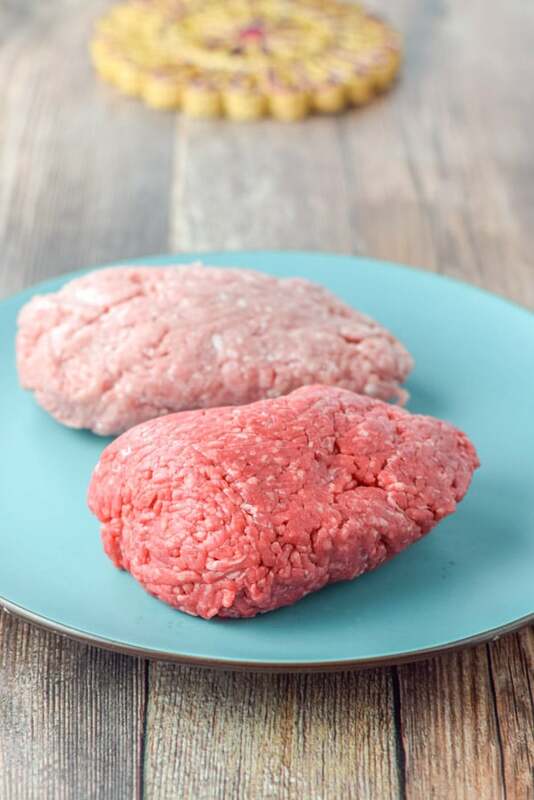 I get the 1 pound of grass fed beef and 1 pound of ground pork from the refrigerator and unwrap them. Sometimes I put lamb in a ragu too, but the store didn’t have any. I plunk the meat in the pan and cut it up with my metal spatula. I sauté it all for around 8 minutes or until it is browned but not fully cooked. See all that uncooked red goodness? 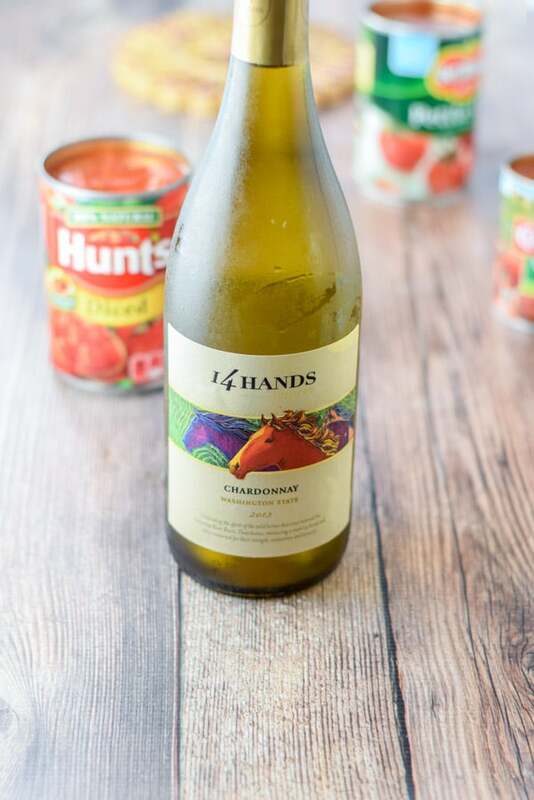 Time to measure out 1/2 cup of dry white wine, open 2 small cans of diced tomatoes, a container of beef broth and a small can of tomato paste. Into the meat mixture they go. I let it come to a simmer and cook it for 2 1/2 to 3 hours. The liquid will reduce and the gravy will thicken up. 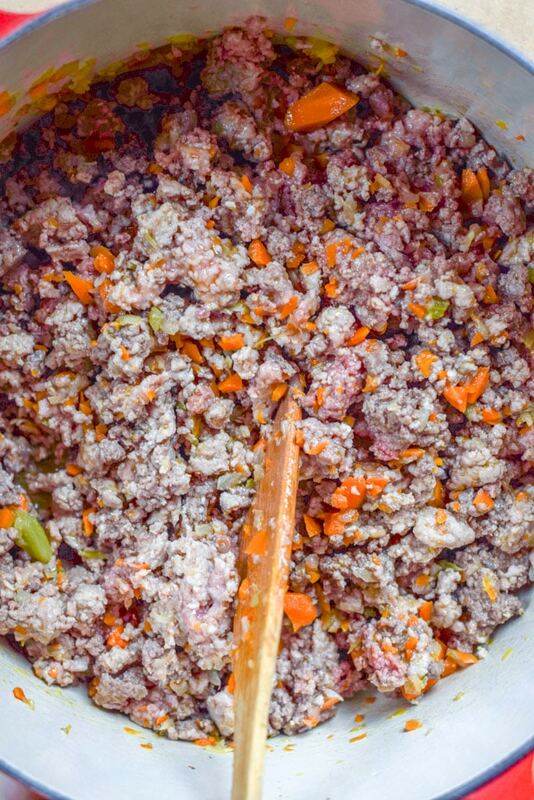 I taste the ragu Bolognese recipe at this point and add more salt if needed. Time to grab the plates and fill them with pasta and a veggie. Oooooo. Let’s ladle some on top of that pasta! Yum, yum. But there is something missing. There we go. We are ready to eat. Please feel free to leave me a comment what’s your favorite pasta? 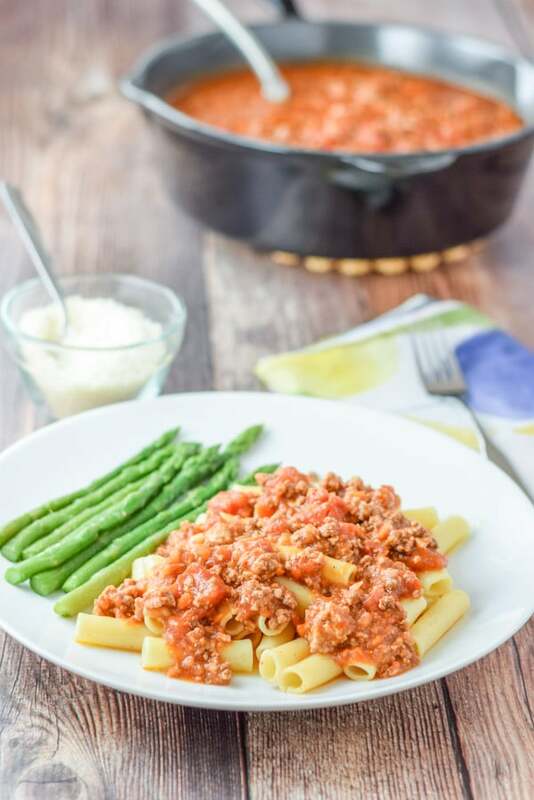 Also, I’m looking forward to trying my blogger friend Pina’s ragu recipe! 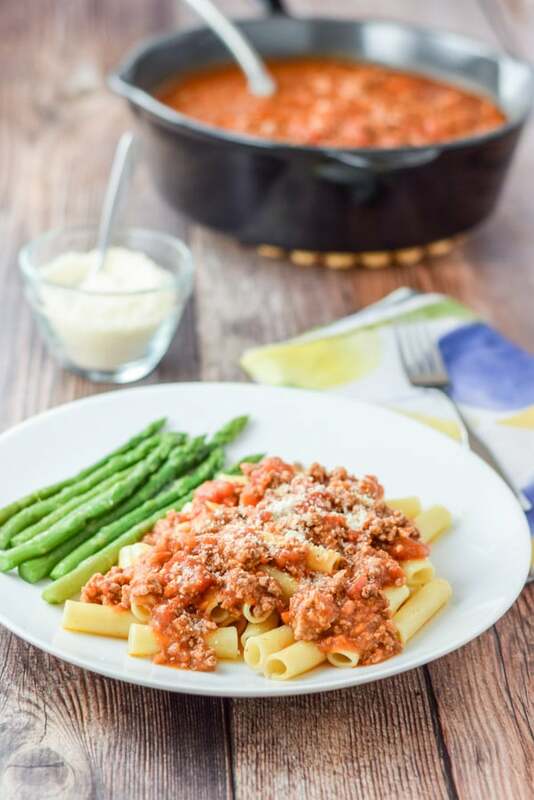 This easy and delicious Ragu Bolognese recipe is perfect on pasta. It's chockfull of meat and so tasty. It is roughly 12 cups of meaty goodness. 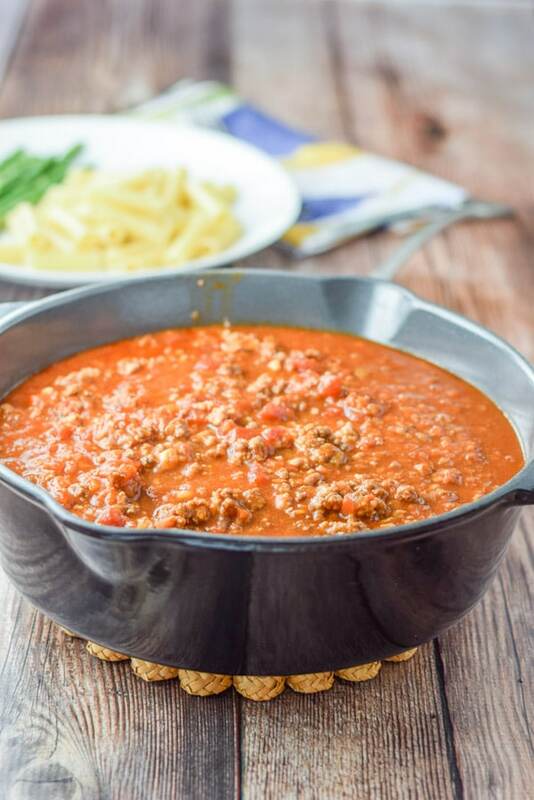 You could put this bolognese on a piece of cardboard and I’d savor every bite. This looks AMAZING- so stinking excited to add it to the dinner menu! Thanks so much. Hmmm, cardboard – I can’t wait to try that. 😉 Very funny! One of my favorite gravy!! Mixed meats make this recipe a standout! Super yummy gravy/sauce.